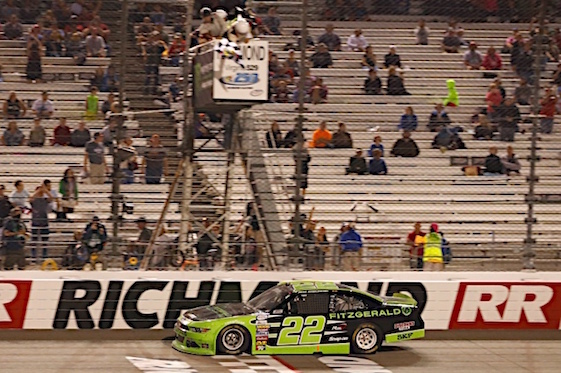 On lap 235 of 250 of Friday night’s Xfinity Series race at Richmond International Raceway, Brad Keselowski passed leader Kyle Busch and then pulled away to win by 3.008 seconds. Afterward, Keselowski said he was happy to get the win and happier still in how he got it. Keselowski was driving a car with the new flange-fit composite body, which will be mandatory in the series by 2019. “We weren’t quite where we wanted to be on the short runs, but good enough to be right there,” said Keselowski, who won for the second time this season, the fourth time at the .75-mile track and the 36th time in his career. “We just hung with him and got the long runs and we were able to pounce. The cars of Keselowski and Busch were the clear class of the field, but behind them, series regular Elliott Sadler rolled home in fifth place and clinched the regular-season championship, along with the bonus of 15 playoff points that goes with it. Making his last Xfinity start of the season, Busch had to settle for second. Ty Dillon ran third, followed by Daniel Hemric, Sadler, Christopher Bell, William Byron, Justin Allgaier and Dale Earnhardt Jr.
Earnhardt’s No. 88 JR Motorsports Chevrolet was the last car on the lead lap, thanks to the long green-flag run to finish the race – the same long run Keselowski was so glad to see. (3) Brad Keselowski(i), Ford, 250. (1) Kyle Busch(i), Toyota, 250. (8) Daniel Hemric #, Chevrolet, 250. (11) Elliott Sadler, Chevrolet, 250. (14) Christopher Bell(i), Toyota, 250. (6) William Byron #, Chevrolet, 250. (9) Justin Allgaier, Chevrolet, 250. (5) Dale Earnhardt Jr.(i), Chevrolet, 250. (2) Brennan Poole, Chevrolet, 249. (7) Blake Koch, Chevrolet, 249. (12) Ryan Reed, Ford, 249. (13) Matt Tifft #, Toyota, 249. (4) Cole Custer #, Ford, 249. (18) Michael Annett, Chevrolet, 249. (15) Jeremy Clements, Chevrolet, 249. (25) Tyler Reddick, Chevrolet, 249. (31) Dakoda Armstrong, Toyota, 249. (10) Paul Menard(i), Chevrolet, 248. (30) JJ Yeley, Toyota, 248. (17) Brendan Gaughan, Chevrolet, 248. (23) Spencer Gallagher #, Chevrolet, 247. (26) Brandon Jones, Chevrolet, 247. (20) Dylan Lupton, Toyota, 247. (22) Casey Mears, Ford, 246. (19) Ryan Sieg, Chevrolet, 246. (24) Brandon Brown, Chevrolet, 246. (21) Ross Chastain, Chevrolet, 245. (35) Tommy Joe Martins, Chevrolet, 244. (38) Harrison Rhodes, Chevrolet, 243. (34) Spencer Boyd, Chevrolet, 242. (39) Garrett Smithley, Chevrolet, 241. (36) Mike Harmon, Dodge, 233. (40) Bobby Earnhardt, Chevrolet, 229. (29) David Starr, Chevrolet, Clutch, 216. (28) Joey Gase, Chevrolet, Rear Gear, 164. (37) John Graham, Chevrolet, Rear Gear, 78. (32) Timmy Hill, Dodge, Overheating, 33. (33) Reed Sorenson(i), Chevrolet, Vibration, 17. (27) Jeff Green, Chevrolet, Electrical, 8. Average Speed of Race Winner: 97.614 mph. Time of Race: 01 Hrs, 55 Mins, 15 Secs. Margin of Victory: 3.008 Seconds. Caution Flags: 3 for 26 laps. Lap Leaders: K. Busch(i) 1-46; B. Keselowski(i) 47-58; K. Busch(i) 59-63; T. Dillon(i) 64-79; B. Gaughan 80-84; D. Hemric # 85-97; K. Busch(i) 98-149; B. Keselowski(i) 150-154; K. Busch(i) 155-172; B. Keselowski(i) 173; K. Busch(i) 174-234; B. Keselowski(i) 235-250. Leaders Summary (Driver, Times Lead, Laps Led): K. Busch(i) 5 times for 182 laps; B. Keselowski(i) 4 times for 34 laps; T. Dillon(i) 1 time for 16 laps; D. Hemric # 1 time for 13 laps; B. Gaughan 1 time for 5 laps.